Women rule in Vienna. At least in the orchestra. I found this on KDFC.Com and Dianne Nicolini. I agree. It’s about time….. The Vienna Philharmonic has announced that it has appointed a woman as concertmaster of the orchestra. The leader of the violin section also traditionally serves as a kind of second-in-command of the orchestra. It’s the first time a woman has risen to this level in the Vienna Philharmonic. In fact, they only began allowing women into their ranks in any capacity as recently as the 1980’s but only on a provisional basis. Full membership in the Philharmonic Society was not granted to women until 1997! The Vienna Phil is one of the world’s top 5 orchestras, with positions often passed from father to son for generations. Well, all I can say is it’s about time! In the market for a nice one-owner used car? It’s 45 years old and only has 30,000+ miles. Extras include a bullet-proof shield, revolving license plates, tracking devices, a roof panel you can remove, an oil slick sprayer, a nail spitter-outer and a smoke screen. Interested? 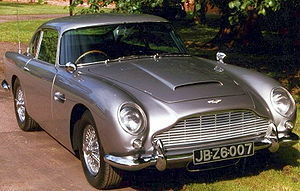 If you can hang on until October 27 and have somewhere between 5 and 7 million dollars, you could have a chance to bid for the 1964 Aston Martin DB5 (British registration number FMP 7B) driven in James Bond movies. Current owner, Jerry Lee, bought the car for 12,000 dollars in 1969 and is selling it to help fund his charitable foundation.